The Little House of Concrete Bookshelves: Andy Neill "Had Me a Real Good Time: The Faces Before, During and After"
Andy Neill "Had Me a Real Good Time: The Faces Before, During and After"
Given the fact that the Rod Stewart quotient in Hughesy's vinyl, CD and digital music collections is limited to a digital An Old Raincoat and multiple versions of the first two Jeff Beck Group albums you might wonder why I'd bother with this hefty wrist-breaker, and after the half way point I was kind of wondering myself. With close to five hundred pages, when the author's finished with Every Picture Tells A Story on p. 238 you'd reckon there wouldn't be a whole lot more that justifies a detailed analysis. 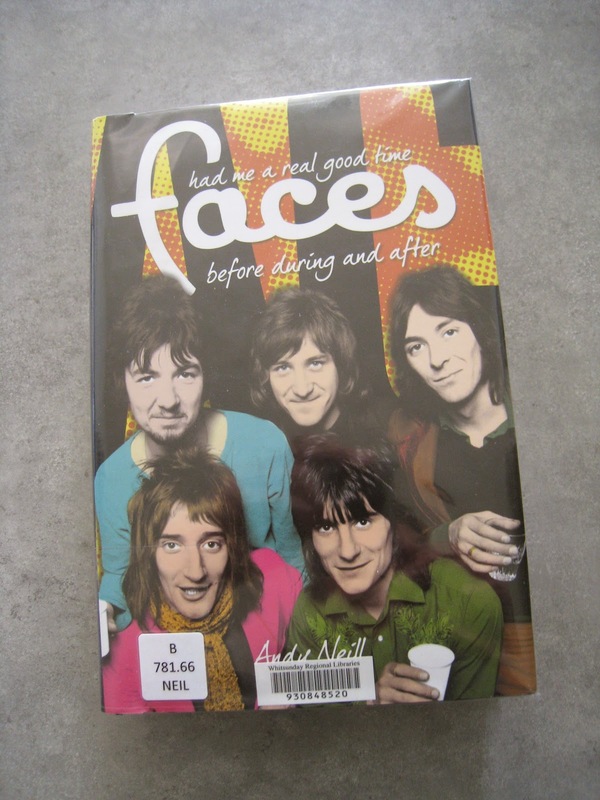 A quick look at the early chapters when I spotted the book on the Recent Arrivals display near the front door of the local library, however, revealed Jeff Beck Group and Small Faces content, and that was about enough to justify borrowing the thing. Who knows? a read might do enough to push me over the side and I could end up buying Gasoline Alley, Every Picture and it might even persuade me to try the tip of the toe in the water as far as The Faces catalogue was concerned. Rock biography is a tricky genre, and Andy Neill set himself a difficult task when he set out to tell a story that ends up combining a couple of fairly distinct strands where incidental characters will need an introduction to an audience that may not necessarily be familiar with them. The biographer can't assume prior knowledge, readers familiar with solo Stewart might not be familiar with Jeff Beck and Beckophiles might not need background on Faces roadies and support staff. As I said, tricky. Then there's the difficult issue that comes with personality. As a general rule people who've been fortunate enough to be gifted with prodigious talent tend to have picked up less savoury personality quirks along the way. Let's just say reading through The Faces saga tends to support that belief, note that practically nobody (including Ronnie Lane) emerges with an unsullied reputation and leave it at that. We are, after all, talking figures with significant egos and odd perceptions of the world around them, and it's here that Neill's thorough approach comes into play. He mightn't be the most stylish rock biographer going around, but when you're working in the area style and gloss come a distant second to comprehensiveness and content. The tome is thoroughly footnoted (a big tick as far as historian Hughesy's concerned) with a seemingly exhaustive combination of chapter by chapter source notes and bibliography, a selective discography and listing of BBC TV and radio appearances, and apparently complete 1969-75 concert file. Neill runs through each major player's career leading up to the Small Faces and the Jeff Beck Group, corrects various long-standing myths and unsubstantiated rumours. The Small Faces transformation from Mod R&B through Top of the Pops hysteria to the Itchycoo Park Ogden's Nut Gone Flake psychedelic period gets a thorough working over. Stewart's transformation from CND folkie to vocal front man through the Hoochie Coochie Men, Steampacket and Shotgun Express to fronting the Beck Group leaves an impression of a man who was determined to make it, but needed to find a niche. The ructions that split Steve Marriott from the Small Faces and into Humble Pie with Peter Frampton, the breakdown of the original Jeff Beck Group are explained, and there's a thorough account of the emergence of the new-look Faces, with vocalist Rod Stewart and guitarist Ron Wood joining the Small Faces rhythm section (Ronnie Lane and Kenney Johes) and keyboard player an McLagan. The delicate balancing act between Stewart's solo work and the Faces' collective entity and its subsequent breakdown are carefully chronicled and the significant bit players including original Small Faces keyboards man Jimmy Winston, Lane's whisky-swilling replacement Tetsu Yamauchi, Stewart's original mentor Long John Baldry, pianist Nicky Hopkins, assorted Rolling Stones, their manager and Immediate Records boss Andrew Loog Oldham all get the appropriate guernseys along the way. At the same time there's nothing that emerges from the saga that has really prompted me to head out and chase down First Step, Long Player, A Nod Is as Good as a Wink... to a Blind Horse or Ooh La La, though those early Stewart albums may end up joining An Old Raincoat in the iTunes Library if they're priced below $10 at the same time as I have an inclination to spend some money and a lack of alternative inspiration. The biography, while interesting and comprehensive ends up, like its subject, interesting but definitely non-essential. 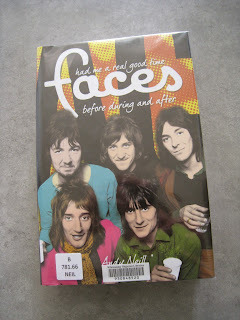 But I'll be rereading the Jeff Beck and Small Faces content before it goes back to the Library.